Are Offshore Sportsbook Lines on Texas Worth Taking? Home - Betting News - Are Offshore Sportsbook Lines on Texas Worth Taking? Offshore sportsbooks are ecstatic that the 2017 college football betting season is in full swing. This week online sportsbook players will be able to wager on Week 3 of the FBS season, bringing us one step closer to the coveted national championship match. In the meantime, there’s no better way to get the blood pumping than by wagering on a little college football rivalry. The USC Trojans and the Texas Longhorns don’t cross paths often but when they do it’s an absolute blood bath. Both teams will be facing off this Saturday, giving top sportsbook fans the ideal matchup to wager on. 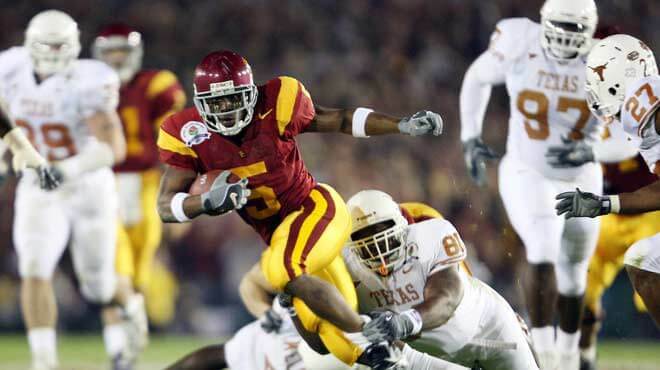 While some college football betting players might argue that Texas and USC don’t exactly have a rivalry, you won’t find anyone who wouldn’t admit that the 2006 Rose Bowl between these two programs is one of the best matches in the history of online sportsbook betting. The night was chock full of highlights from both teams. And for those who don’t recall, the Longhorns managed to scrape past the Trojans 41-38. Since then, the Trojans have been itching for a chance at revenge. An itch they’ll finally be able to scratch this weekend. Let’s take a gander at what the offshore sportsbook odds are predicting. As is to be expected, the nationally ranked team is coming into this contest as the online sportsbook betting favorite. The Trojans are also coming into this contest with an unblemished 2-0 record as well as a No. 4 nationwide ranking. The Trojans kicked off their 2017 season by facing the Western Michigan Broncos and defeating them 49-31. The scoreboard makes it seem like the game was much closer than it felt, but the yardage doesn’t paint that picture. USC managed to outgain the Broncos 521-94 yards. The reason the contest was close was due to the Trojans throwing 2 interceptions, something they should address moving forward. The following week the Trojans faced No. 14 Stanford in their first real challenge of the season. The Trojans came out on top defiantly 42-24. USC also vastly outgained their opponent in yardage, 623-342. The Longhorns haven’t enjoyed the success USC has enjoyed this season and come into this contest with a 1-1 record. Texas opened up their 2017 season by facing the Maryland Terrapins and suffering a 51-41 loss. The following week Texas rebounded in their Week 2 contest against the San Jose State Spartans. The Longhorns put on a clinic handing their unranked opponent a 56-0 shutout loss. Texas now prepares to face their biggest challenge of the season yet and it’s clear online sportsbooks aren’t giving them a fighting chance. Top Sportsbook Bets to Make: The Longhorns have been too inconsistent to actually have a chance of upsetting a top-4 team. Stick to USC on this one.